Something called the Super Bowl is coming up this weekend. I’m not sure what it’s all about other than I get to watch Justin Timberlake for a hot minute and I get to snack. I could care less about the rest. And since we are heading to a friends house who makes some of the best snacks, I’ll be quite happy to listen to football for 4 hours straight. Not watch. No thanks. 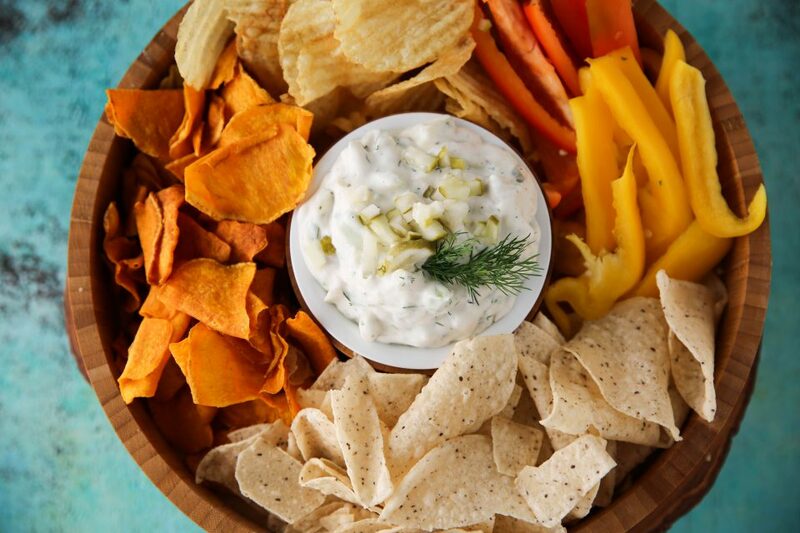 And I think I might be bringing this dip because it’s delicious on chips and I even ate it on some leftover meat the next day! Delish! But let’s get to what’s important here…The Bachelor. I’m a week behind on my recaps so this recap is all from last week, not last nights episode. The episode starts off with Chris Harrison telling all the women they are about to go around the world…to Lake Tahoe. Way to burst their bubble, Chris. Except Lake Tahoe looks stunning and is definitely on my list of places to visit…when it’s summer outside. My days in a snowy place are very limited. Sienne gets the one on one date and they go parasailing. After parasailing, they sit on a dirty beach and try to force conversation. Sienne seems like an incredibly intelligent, put together woman and she keeps saying how she really likes him. But as we watch this date, it’s pretty obvious they have absolutely no chemistry. Sienne mentions that she loves the sound of waves and Arie says, “waves are awesome.” If I’ve learned anything from this show, it’s that I need to calm TF down when it comes to saying awesome and amazing. Because Arie says it so much that it’s turned into a drinking game. See if you notice it. Then drink every time Arie says awesome, amazing, like or makes noises while he makes out. You may die from alcohol poisoning. Just a heads up. After their lake date, they go to the extremely romantic Hard Rock Hotel. I’ve always dreamed of going on a date there. That’s a joke. I hope you understand me at this point of our online relationship. Sienne goes on this long chat about feeling like she will never be loved. Then Arie gives her the rose and a super romantic peck. You know Arie makes out with his hand whenever possible, so for him to only peck her…that was just weird. And surprise surprise, their date ends with everyones nightmare – dancing on a platform with an audience while being serenaded by some random singer. Why does The Bachelor LOVE this kind of date? After their suuuuuupes boring date, Maquel (whose name I think I’ve been spelling Mikel like an assh*le the whole time) is told that her grandpa has passed away and she heads home. I’m sorry, Mikel, that’s terribly sad and I hope your family is healing. And I hope you throw away the dried roses you’ve received while on the Bachelor. Drying roses stops being cool after high school. And that’s generous. But for real, so sorry Maquel. Now for the group date. Pretty much every single person in the house is on this date out in the Lake Tahoe wilderness. This wilderness survival couple gives everyone a water bottle to pee in. Then they make Arie drink his…JOKE, it’s apple juice. A few of the girls almost drink their own pee. I can’t. Then they have to eat bugs and Kendall is INTO IT. Kendall is the girl who loves taxidermy. Kendall also talks about herself in the third person. Juli thinks that’s weird, Kendall. The girls have to split up into groups and hike their way to some sort of BEAUTIFUL cabin. If I didn’t have to hike to a cabin like that, I’d totally go. Because it looks aweeeesome. Sh*t, I sound like Arie. Once they get to the cabin and hop into the hot tub, the production team decides to make it all about Krystal. Someone had to become the villain of the season and the production team decides it will be her. Krystal just says things like how she is flawless and many other things that only a therapist would say, which makes it super easy for people to put a target on her back. She had one of the first dates with Arie and met his family and went to his home so it makes sense she’s so confident. You know the production team is just egging her on and getting in her head to make her look bad. It’s so sad. Her instagram page is probably full of the meanest people right now. It makes sad. Nothing really happens on the date other than the production team making Krystal look bad. But then Arie pulls Lauren off to chat. Lauren asks, “What are you looking for in a person? I know you said you need someone with a flexible schedule.” Ummmm…that’s an odd need. She also says, “I want to have a relationship where we’re old and gross looking and still spanking each other’s butts and telling dirty jokes.” Excuse me, what Lauren? You’re doing the word vomit thing right now. The episode ends with Arie and BeKAH going on a one and one date. Hot tub date. It’s quite apparent that Arie is incredibly into BeKAH. He actually talks when he’s around her instead of just saying awesome and amazing 47 times in a row to fill a void. BeKAH’s age finally comes to light to Arie. She’s 22 and he’s 36. And guess what? He don’t give AF. Does any guy? I’ve never met a guy who wasn’t interested in making out with a younger woman. He keeps mentioning how young she is but then quickly goes on to make out with her with his fingers through her giant hoop earrings. Frightening move. I hate giant hoops. And BeKAH owns 40 pairs. The episode ends with Arie cancelling the cocktail hour before the rose ceremony. I wonder if he did that to just get in bed earlier. He has mentioned that he loves to go to bed early. Which I totally relate to. He then boots Brittany and Caroline. Which I’m totes bummed about because I really liked both of them. I kind of had a girl crush on Caroline. If I were into women, Caroline would probably be my type. I have no idea why, but I just feel it. Brittany says that she’s hopeful for the future while frowning and crying. Super believable. You got this, Brittany. You got this. Cover and place in fridge for 1 hour before serving with plantain chips, sweet potato chips, avocado oil potato chips, cassava coconut tortilla chips, and veggies! yayyyyy!! thanks for the that feedback! i love putting that part together because it brings me back to old recipes and memories! Yes! Me too! I made your Slow Cooker Buffalo Chicken Chili on Monday, after it popped up on the “You may also like”. Thank you! It was delicious. awesome!! so happy to hear that! Would this work with regular dairy cream cheese and yogurt too, or would the vinegar make it curdle? yes, it should still work great! Can I just say that your bachelor updates are hilarious. I can’t stand watching the show, but I feel like I know exactly what is going on because of your summaries. LOL. Thank you! I have never watched the Bachelor but just saw in the news today that Bekah’s mother had reported her missing to Humboldt County, CA authorities back in November. Thought of you right away! P.S. Love, love, love your podcast! hahaha someone sent me that article! what the what lol!? This dip is nuts. So, so tasty! 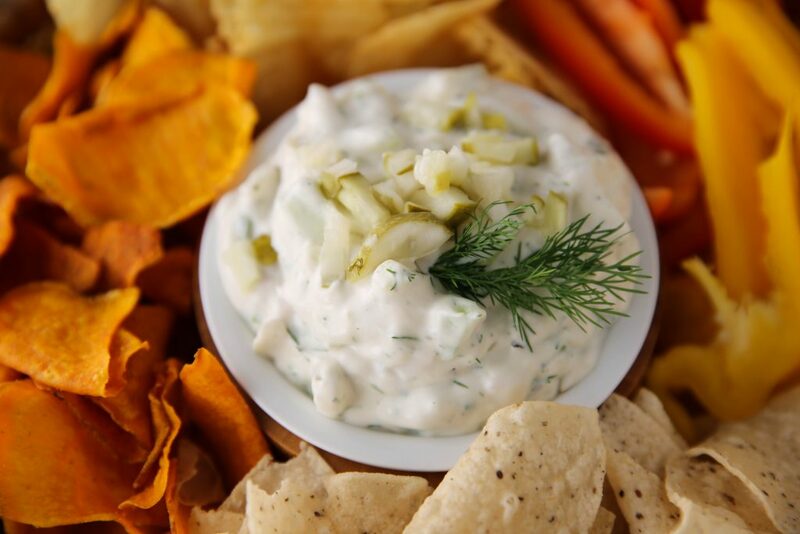 Like a pickle-y tzatziki. 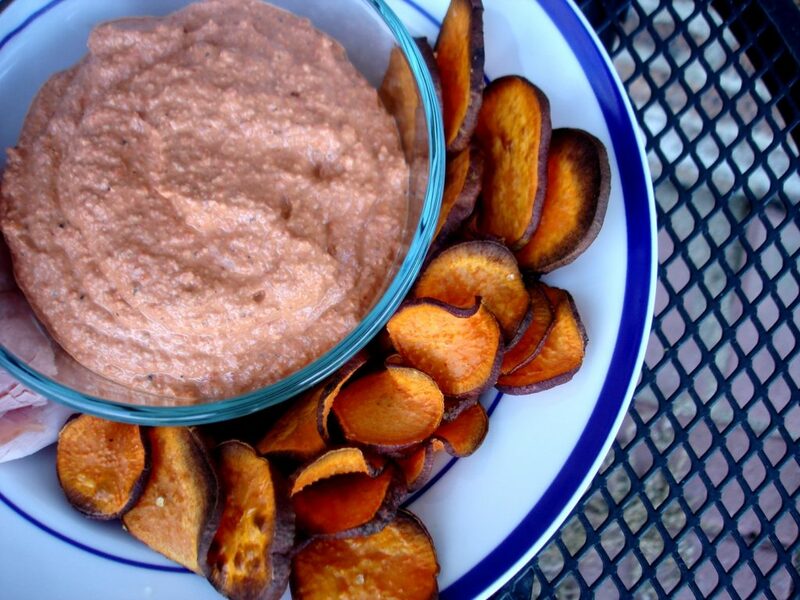 I fed it to my husband with sweet potato chips and he had no idea it was dairy free. I should’ve doubled the recipe! can you explain what button you are clicking on because all the pinterest buttons i click on are working! Another recipe, knocked out of the park! Meant to give it a 5 star rating! 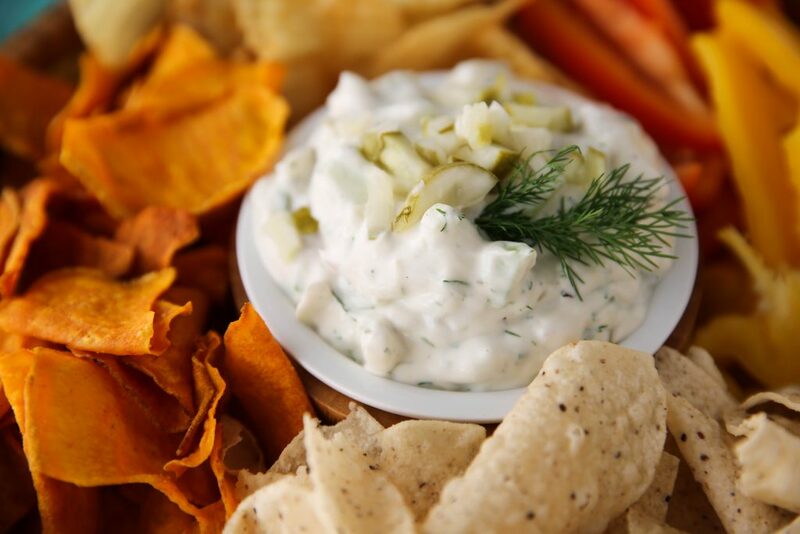 This dip was a HUGE hit. Everyone loved it and asked for the recipe. 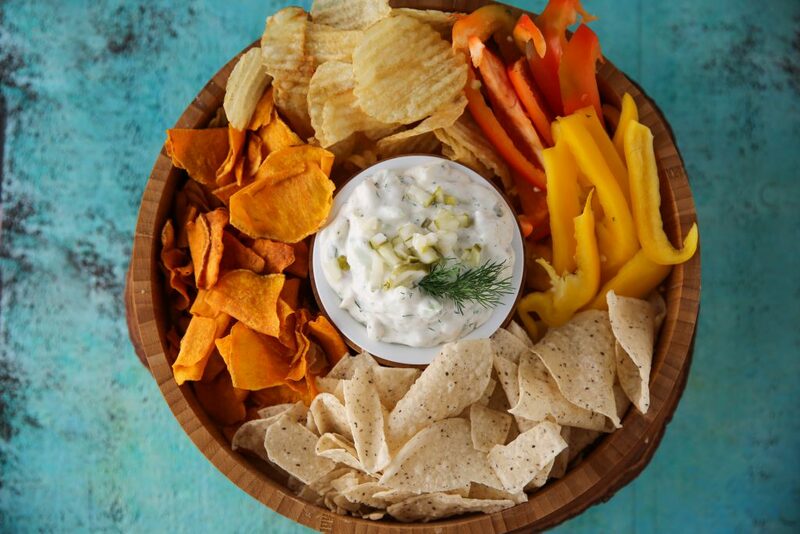 We had a ridiculous amount of food at our Super Bowl party and had a ton leftover at the end of the night…but this dip bowl was empty. Thank you!! 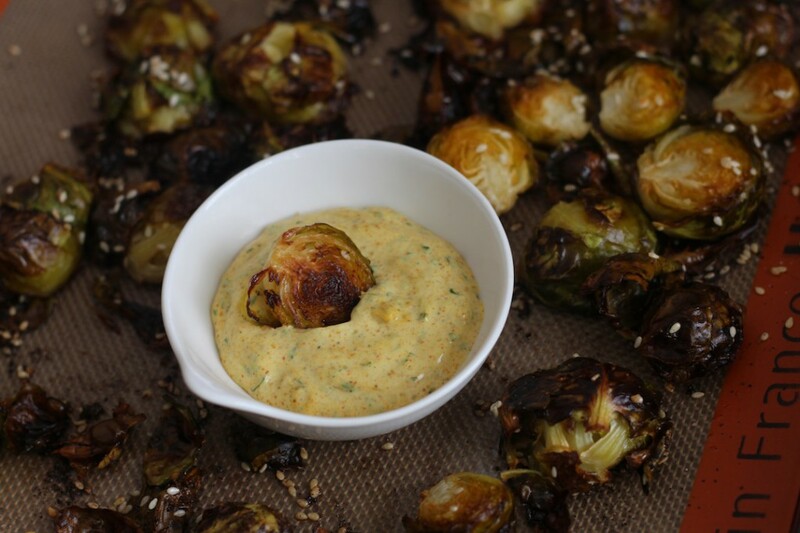 We LOVED this recipe – no one even knew it was dairy free. 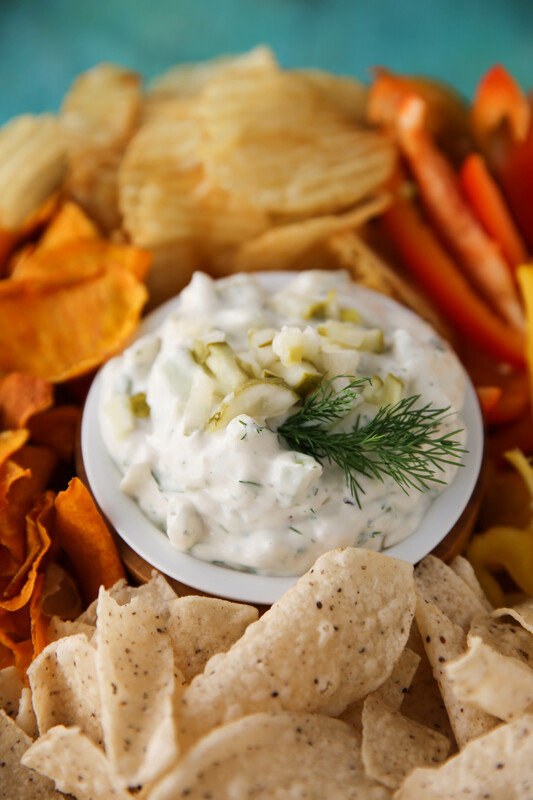 I love dill pickle dip! It has been so long since i’ve made it. But I think you’ve inspired me to make it again. Thank you so much for sharing! What a great recipe for the super bowl. Unfortunately, I’m going to have to find another event to make it for! I need to make this! 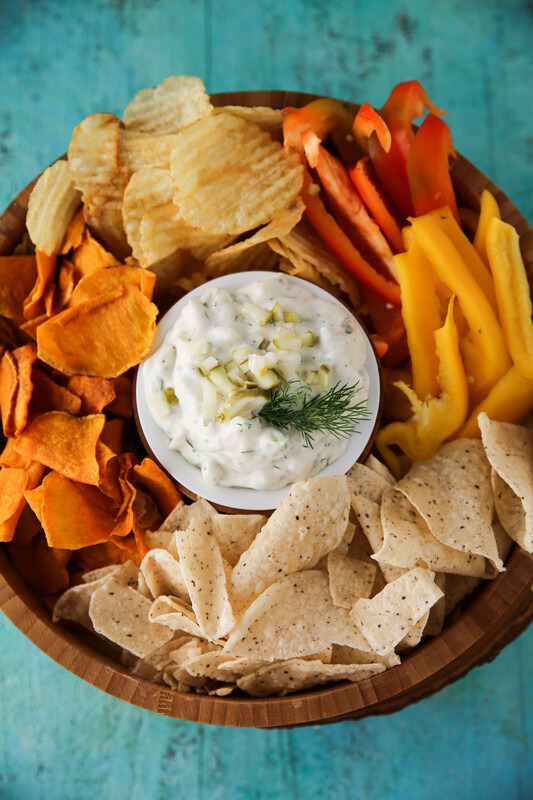 I love dips and those avocado oil boulder canyon chips..so good! !